SAN DIEGO (CNS) — “Pro-life” isn’t a label that actor-director Nick Searcy would claim for himself. “I think some pro-life people might consider me too pro-choice, and pro-choice people would consider me too pro-life,” he said during a telephone interview in early January with The Southern Cross, newspaper of the Diocese of San Diego. But what Searcy can’t stand is obfuscation. Searcy, whose prolific career includes six seasons on the TV series “Justified,” isn’t shy about expressing his conservative views on contentious issues, as even a cursory look at his Twitter account proves. Still, when he signed on to direct the 2018 film “Gosnell: The Trial of America’s Biggest Serial Killer,” in which he also appears in a supporting role as Gosnell’s defense attorney Mike Cohan, he had no intention of turning the fact-based drama into a piece of propaganda. Rather, he wanted to let the shocking story speak for itself and hoped it might inspire audiences to reflect on such questions as when life begins and what’s the difference between killing a child mere seconds after birth as opposed to in utero. The film, which opened in theaters last October, became available on video on demand Jan. 22 and will be out on DVD Feb. 5, was based on Ann McElhinney and Phelim McAleer’s book, “Gosnell: The Untold Story of America’s Most Prolific Serial Killer.” It chronicles the investigation and trial of Dr. Kermit Gosnell, an abortionist in Philadelphia. The FBI, Drug Enforcement Administration and local police raided Gosnell’s clinic in early 2010, expecting to find evidence of the illegal sale of prescription drugs. But what they uncovered was much more disturbing. In addition to extremely unsanitary conditions and astonishing laxity with regard to medical procedures, law enforcement also discovered fetal remains stored in containers in the lunchroom refrigerator, as well as jars containing severed babies’ feet. Among other things, the investigation revealed that the clinic had performed illegal late-term abortions and had even delivered live babies only to kill them by cutting their spinal cords with scissors. 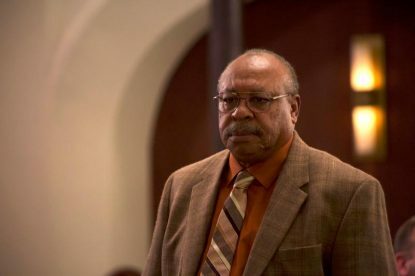 In May 2013, Gosnell was convicted on three counts of murder for the deaths of babies and the involuntary manslaughter of a patient who died during a 2009 abortion. However, the film’s press materials note, the death toll is believed to extend into the hundreds or thousands over the course of his three-decade-long career, thus earning him the moniker in the film’s title. Gosnell is currently serving a sentence of life in prison without the possibility of parole. Searcy said that, in dramatizing these recent events, the film doesn’t have a political axe to grind. “Let’s not make up anything, let’s not exaggerate anything, let’s just tell the story as straightforwardly as possible,” he said, summing up the approach he adopted when he came on board the project. From the perspective of many in the pro-life community, the Gosnell case also exposed government officials, who had allowed a facility such as Gosnell’s to remain in operation for so long, and the mainstream media, which initially appeared to have little interest in covering the story. A now iconic photo showed the rows of empty courtroom seats that were reserved for the press. Perhaps unsurprisingly, the film’s subject matter wasn’t something that interested major Hollywood studios. So, to bring the story to the screen, the producers launched a crowdfunding campaign through Indiegogo. The record-breaking campaign raised $2.3 million from almost 30,000 donors in a span of only 45 days. In making “Gosnell,” Searcy said his biggest concern wasn’t being blackballed within Hollywood for his association with the project, but that after all of the cast and crew’s hard work and the financial support of so many donors, the film would be ignored. In effect, the media responded to the film in a way that echoed their early silence about the trial itself.